Dubophonic has turned toward Cyprus this time and to the local artists, introducing one of the most active Cypriot artists in the reggae scene. Producer & riddim maker Med Dred has always been into music, addicted from the young age of 7, a good 20+ years ago! He is one of those artists, who are passionate with their music. Studied in the United Kingdom City & Guilds (Sound Engineer), the Cypriot artist then went off to further his studies with a Bachelor’s Degree in Texas and a Master’s Degree in the UK at the Trinity Southern University. He has been refining his sound ever since. "Reggae has always been my passion as I was brought up in Brixton and went school there so my musical influence has always been a heavy bassline on a reggae riddim. Some of my mentors are: The Scientist, King Tubby, Black Uhuru, Mad Professor, Sly & Robbie, Bob Marley, Eek a Mouse, Gregory Isaacs ... and too many more Kings, not enough room here to mention! Jah Guide, Protect & Bless all." - M.D. On his debut release on Dubophonic netlabel, Med Dred introduces a style that is deeply rooted in the history of reggae music. Inspired by the old dub masters and sound engineers of Jamaica, Med Dred manages to assimilate their sound and transform it into something new, either by incorporating his own custom made effects, improvising on the melodica or using his voice snippets to send out his anti-Babylon messages. 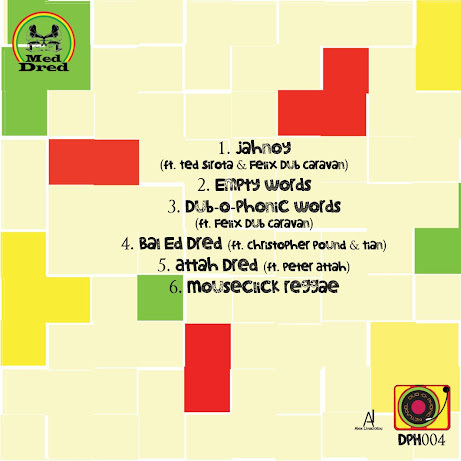 The "Dred Reggae” EP includes six tracks, dubbed and remixed by Med Dred exclusive for the Dubophonic netlabel. Heavy one drops, deep echoes and reverbs, heart pounding bass lines and conscious lyrics are the ingredients of his musical recipe. 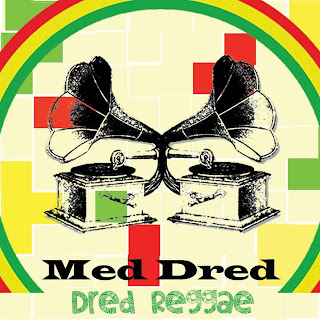 Accompanied by many guests, Med Dred creates his own personal sound, still remaining true to the original roots of reggae music. Special participation of Ted Sirota (drums) on “Jahnoy”, Felix Dub Caravan (bass) on “Jahnoy” and “Dub-o-phonic words”, Christopher Pound and Tian (bass) on “Bal Ed Dred” and Peter Attah (vocals) on “Attah Dred”. Give thanks Alexandra Leivadiotou for the cover art! Med Dred featured on "Sounds of the Carrebean"
Dred Reggae: Une excellente sortie qui laisse augurer une longue vie à ce jeune netlabel.